By mounting these handguards to the lower portion of the handlebar, KTM has increased clamping pressure, eliminated application variables, and provided unparalleled clearance for cable routing. 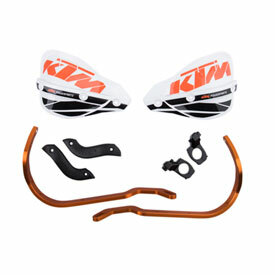 By doing so, KTM has made it much simpler to buy handguards. Not compatible with EXC models. Fit and finish are great. You will need to tap the holes to remove anodizing. I would recommend this product. Good product. All hand guards are difficult to install, but these were easier than most. Does this fit the 2019 300 xc-w tpi six days? BEST ANSWER: Yes, my riding buddy has them on a 2019 300 xc-w tpi. His isn't a Six Days, but you'll probably be fine. The design of the clamps allows some adjustment. Will these fit a 2014 250XC? What replacement shields fit these? BEST ANSWER: These are a universal fit and not listed as a machine specific part. I do not show a replacement shield part number at this time. will these fit a 2018 250 XC-F? BEST ANSWER: Yes, if you have a 1 1/8" Bars. does this work on xc-w models? BEST ANSWER: Unfortunately this handguard set is not compatible with EXC models.